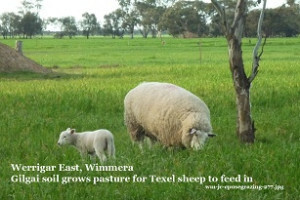 – and produces feed from it for the sheep to graze for farm income. – and after rain make sticky mud. 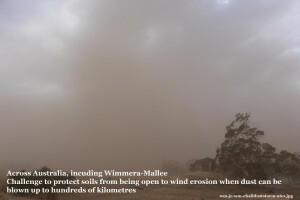 – If covering grass is lost, the fine clay particles can be eroded by winds. 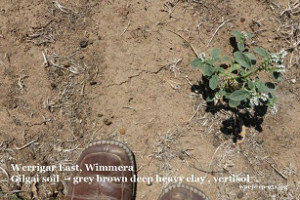 We aim to keep sheep off the paddock when the ground cover has been eaten, and put them into a stock containment paddock . Summer weeds like Heliotrope grow after rain, so we need to kill or remove them to conserve soil moisture for the next crop. – more soils supporting grazing of stock are in Soil Selfies from Kilmore and Lima South in Victoria, Long Flat in South Australia and Mt Poole in Outback New South Wales. Credits Jeanie Clark gives permission for her photos and information to be used under a (cc) license 2015. Editing and page created by Jeanie Clark, enviroed4all®, Warracknabeal, for use in education under a (cc) licence 2015.